All Bausch + Lomb Products Are ON SALE !!! 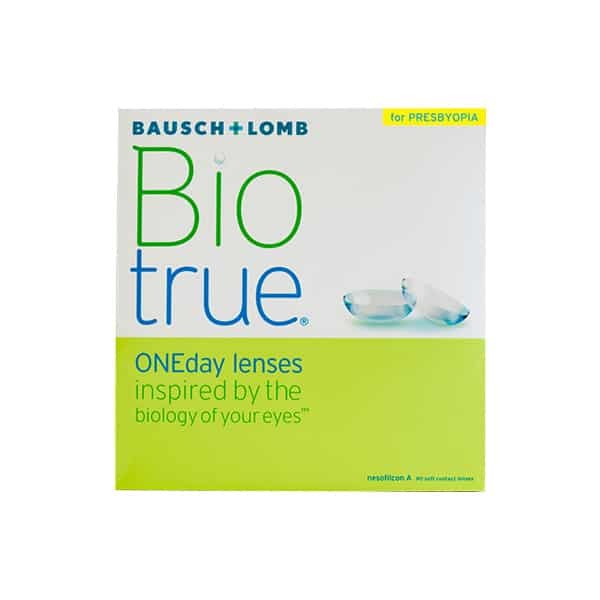 Biotrue ONEday for Presbyopia 90pk from Bausch & Lomb are brand new contact lenses. These NEW Biotrue ONEday lenses are made from a next generation, bioinspired material called HyperGel for comfortable vision throughout the day. The outer surface of the lens is designed to mimic the lipid layer of tear film to prevent dehydration and maintain consistent Optics; features the same water content as the cornea, 78%, to support incredible comfort and allows oxygen to flow freely through the lens, without the need for silicone, delivering oxygen level the open eye needs to maintain healthy, white eyes. This revolutionary new daily disposable multifocal lens has a 3-Zone Progressive Design for clear vision close up, far away, and everywhere in between. Plus the breakthrough lens material works like the eye’s own healthy tears to retain the same moisture level as the natural eye — for comfort throughout the day. We have a 1-year return policy for this product if the box is unopened and undamaged. Check out our return policy here.